Parme Trans was founded in 1997 on the basis of the transport and logistics structure named Meoni Parsek AS and immediately became a member of the Estonian Organization of International Carriers (ERAA). 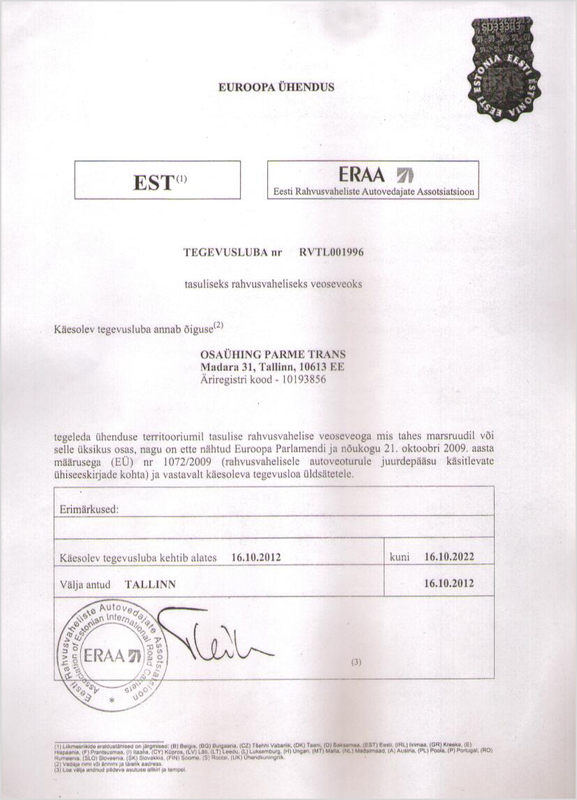 In 1998 we were accepted to the Estonian Camber of Commerce and Industry due to our accurate coordination of transport and reducing delivery times. The rolling stock of Parme Trans is constantly updated. The age of our trucks does not exceed 3 years. All trucks are equipped with most modern navigation equipment and satellite tracking system enabling to determine the location of a truck with up to 1 meter accuracy as well as communication means. We got the opportunity to launch cabotage transportation within the EU countries and between EU ports in May 2009 after Estonia joined the European Union. This event resulted in disappearance of CEMT permit. We were accepted to the Estonian Camber of Commerce and Industry in 1998 due to our accurate coordination of transport and reducing delivery times. How were we awarded with ISO 9001:2008 and 14001:2004 quality certificates? 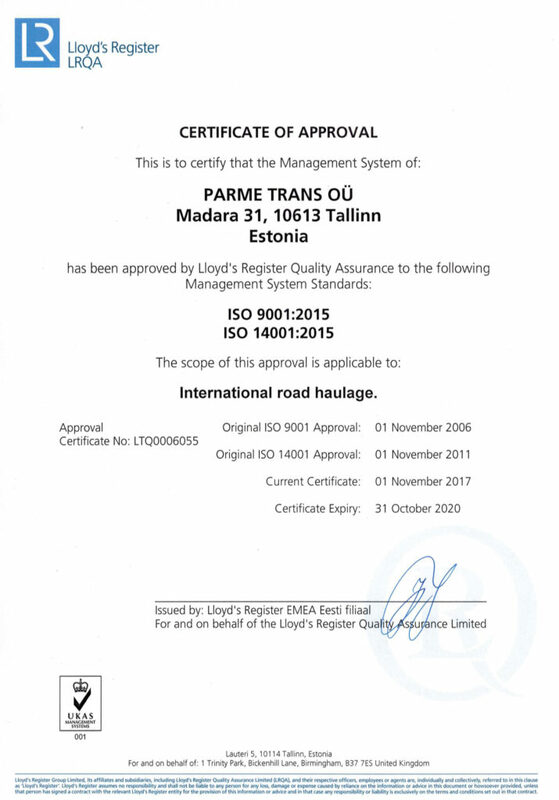 2009 Parme Trans successfully complete ISO 9001:2008 certification conducted by the internationally known company Lloyds Register Quality Assurance (LRQA). 2011 Completion of certification process for compliance with ISO 14001:2004 requirements. 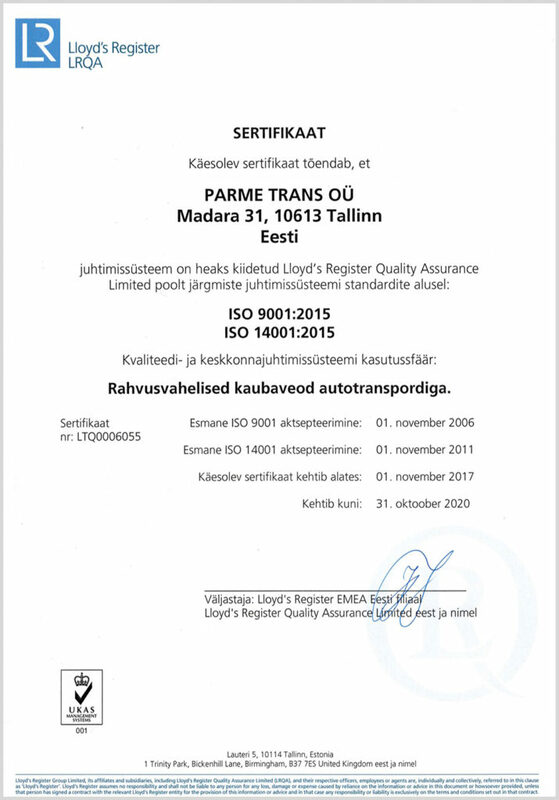 2016 Transportation company Parme Trans becomes one of the few companies dealing with international transportation and constantly verifies high quality of its services by completing certification under the world-famous quality management system ISO 9001 and ISO 14001. 2017 Completion of certification process for compliance with ISO 9001:2015, ISO 14001:2015 requirements. In December 2009, Parme Trans received a certificate from the Ministry of Interior of Great Britain. 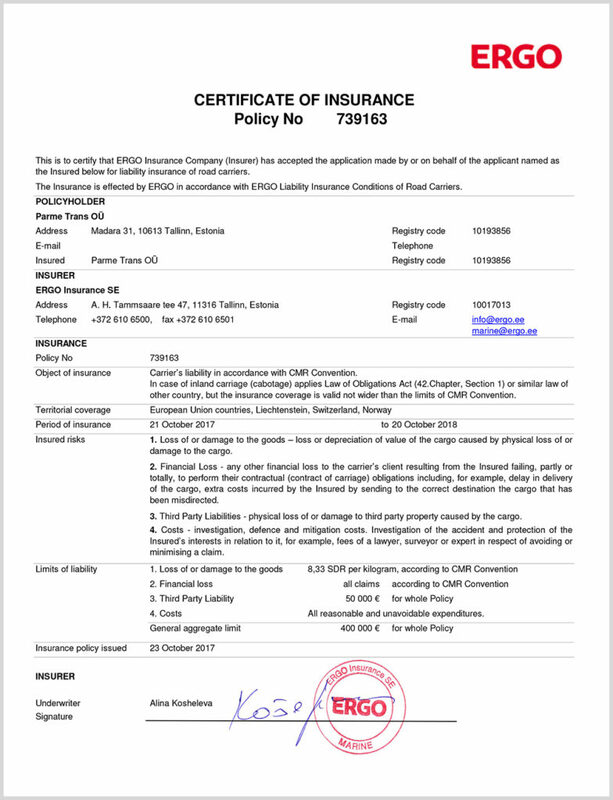 The document proves that the company fully complies with all the standards and requirements imposed on transportation enterprises operating in the territory of the United Kingdom. We since confirm our Home Office accreditation each year. Parme Trans also develop its own unique check-list system. The system prevents any attempts by migrants to illegally cross the English border, and also increases the level of cargo transportation safety. All our employees undergo a special training in fighting migrant trafficking.